Not long after we discovered and began learning Unity (our current development environment of choice after we stopped using XNA), we found the hidden gem that is the Unity Asset Store. The asset store is a place where developers can both buy and sell Unity "Assets" - pieces of code, 3D models, music, 2D sprites or anything else that could be used to aid the creation of a game. A lot of assets are free; others are typically a few dollars, and there are many thousands of them on the store with everything categorized. With the Asset Store clearly being popular (the numbers of unique user ratings prove this), a few weeks ago we decided we'd try to sell an asset. Without anything specific in mind, we opted for a small editor extension we'd already written as part of the development of a new game, which we thought was useful enough for other developers to want to buy but not so obscure that nobody would find it useful. We'd already done the hard part in writing it for ourselves, and we had no problem sharing the source code (most assets provide full source code, a recommendation we were happy to go along with). In one of our projects, we need a 2D sprite to "shatter" into many pieces and we thought other people could find this a useful bit of functionality to add to their games. So, we spent a couple of days adding a decent front-end and packaging it up, we gave it a name (Sprite Shatter), designed a logo (see left) and we were ready to go! The submission process was simple. Fortunately, we were approved first time, a process which took only a few days to complete. It is worth reading the submission guidelines as there were a few things in there we would never have thought of - for example assets that change the way the Unity editor works must make full use of the "Undo" feature, which is something that must be added programmatically. And so, Sprite Shatter is now on the Unity Asset Store, and although it's hardly set the world alight, it has sold copies at $5 each. And that's all for something that we had written anyway, and are going to use in our own projects anyway. All we had to do was give it a small amount of polish to make it available for anyone. 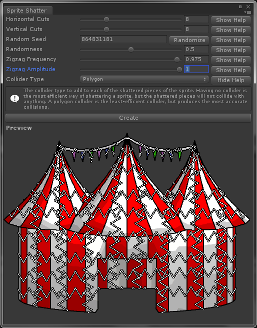 As an extra touch we added an example project that shows how the asset can be used, and some detailed instructions, something encouraged but not required by Unity. Our overall impression of selling on the Asset Store has been positive so far. Having browsed through it to do some research before we created Sprite Shatter, we discovered tons of useful assets, a few of which we are considering buying to help our own development. Unity have made no secret of the fact that it is often the larger, more expensive assets that have attracted the most attention and sales, and some of them look akin to a game in terms of the number of hours the developers must have put in. It's unlikely we'll be putting a lot of time into creating assets (we'd rather make games!) 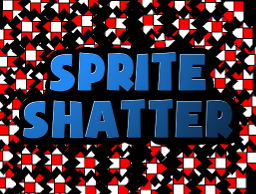 and Sprite Shatter is a relatively small one, but it's our first go and we're proud of it!